Wooded course moving up and down the side of a hill. Very challenging. From I-565 take exit 17 to Jordan Ln., go north 4 miles to a right on Mastin Lake Rd., 0.7 miles to a right on Watson Dr., to park entrance, take left, course in woods. Very fun mostly wooded course, not too dense however. I am an amateur and hit trees on 4/18 drives. Also, if I was off the mark on my drives, it was very easy to find my disc, even with many leaves on the ground. There was no one there when I played at 7:30 AM, and that was nice after having played at Indian Creek and Monte Sano. 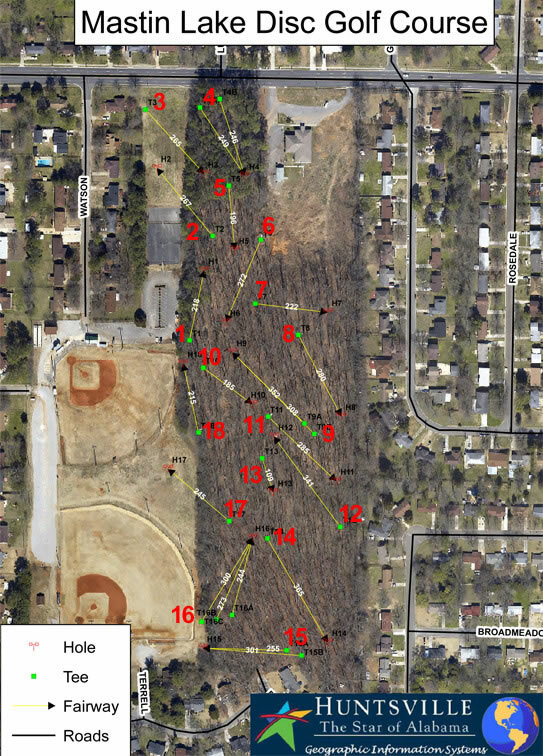 Course is beautifully set in a fairly dense wooded area. Pros: tight fairways that don't allow for a lot of room for error. Course is well maintained and has good markings for layout. Shots have good variety. Cons: Didn't use a lot of the length that they had available to them. Should have tried to stretch holes out more than they did. Good course and fun to play. Well marked and well laid out. Pretty wooded course. A lot of elevation changes. Recently redone over that past year. Side Note: Recommend using bright colored discs during fall, a ton of leaves on the ground! Very fun course with a mix of shots needed. Liked that it was hilly, but didnt wear me out with the hiking. Hope to make it back down to Huntsville again.